Hi all! I hope you had a great weekend! I have a very simple card for today as I'm buried under laundry now that we are back home! I used Charmaine's Weekend Sketch #87 from a couple of weeks ago. When I first saw the sketch, I thought it was a fun one, so I filed it away until I could play with it. I pulled out some of the fun patterned paper by Cosmo Cricket (Early Bird packet). My chipboard flowers were painted with Butter Cream Shimmerz, then each was topped with a red button. I hope you have a wonderful week! Thanks for stopping by! Accessories: Chipboard Flowers (CTMH), Shimmerz, Ribbon, Buttons, Twine, Thread, Sewing Machine. I LOVE this card - so simple & pretty!! I love your button flowers! Very bright and cheerful colors! Love these papers! 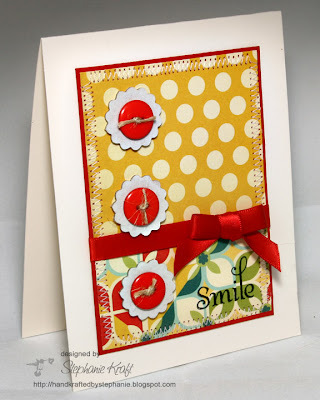 This card is so cheerful!